How to get Affiliate Link For FormGet? Sign-up as a normal user for FormGet, then in the dashboard you will get “Become Affiliate” from the drop-down menu, just click on the tab and you will find the affiliate link. How to get Affiliate Link For MailGet / MailGet Bolt? Just a few simple steps to sign up. MailGet: Sign-up for MailGet account, then in the dashboard look for “Affiliate” from the drop-down menu, just click on the tab and you will get your affiliate link. 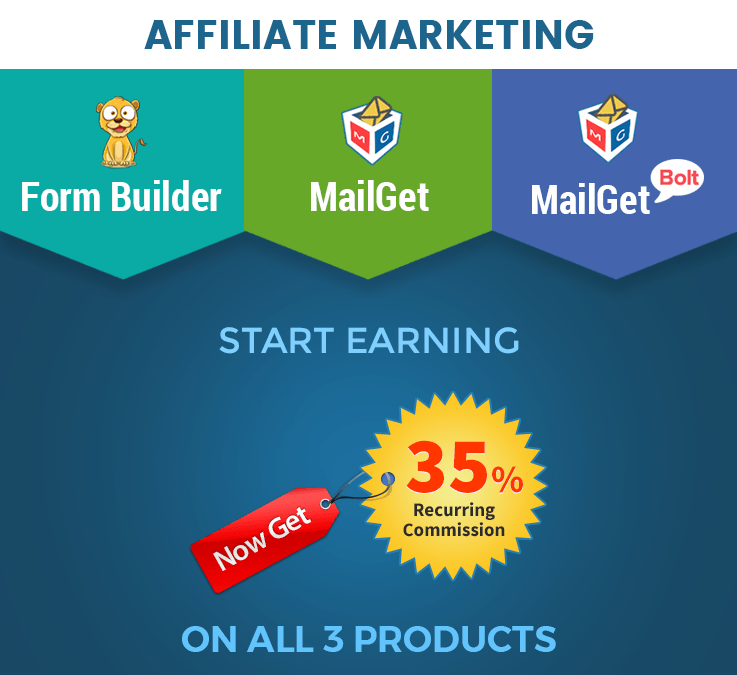 MailGet Bolt: Sign-up for MailGet Bolt account, then there is a drop down feature on the dashboard where you will get “Affiliate”, by simply clicking on it get the affiliate link. You can link to us using text links or banners. You are not allowed to purchase from your own affiliate link and promote the product via Coupon Code. In those cases, sales won’t be considered. The affiliate links that you generate is tracked by our system, So when a user will purchase an item using your affiliate link, within 60 days, our system will add affiliate commission to your account automatically. Our system will email you once a purchase has made using your affiliate link. You will get 35% recurring commission on every sale you bring to us (Applicable to all membership plans). You can login to the dashboard any time for access to real-time reporting, which provides up-to-the-minute information about the commissions you’ve earned every month. All affiliate payments are processed sent directly to you by the first week of each month for the previous month’s sales, via the Paypal. You will not receive credit when purchasing a membership package through your own affiliate link. You may receive an automatic notification from FormGet to let you know that a sale has taken place, but your affiliate payments will not include this amount. What is your Affiliate Program? Our affiliate program financially rewards you for directing customers to our FormGet Custom form building application. When a product is purchased by a customer you refer, we pay you a commission for the sale(s). How do I join your Affiliate Program? You can just make registration as a normal user, once your registration gets complete you are eligible to promote our product with your affiliate link. How does your Affiliate Program work? Our affiliate program allows you to make money by referring customers to our website. You can do this by placing links, banners, product reviews, or any of the other content we provide you with on your website. Each time you refer a customer to us and that customer makes a purchase, you earn a commission. How do I get Paid? You will get paid on every first week of the next month, You will get your sale amount directly in your Paypal account. Once the sale will occur we will contact you for the further payment process. Does it cost me anything to become an Affiliate? It’s absolutely free to join our Affiliate Program. There’s no charge to apply and there’s no minimum sales requirement. How much can I expect to earn? That’s completely up to you. We can help if you need something specific to promote FormGet your way, but your profit potential completely depends on your sales. Our standard commission rate is 35% of every sale you make. Also, the commissions are paid out only after they are approved. Approve: The commissions are approved only when the user is still using our service and has an active account. This is subjected to any our free trial periods or 30 days after the sale has been made. Disapprove: We disapprove the commission when the referred client’s account is subjected to any refund or violates our terms and conditions. Can I promote FormGet on more than one website? Yes, absolutely. You can promote FormGet across one or all of your websites. The more links and content you place on your websites, the more qualified visitors you’re likely to send us — and this should translate into a higher conversion. I don’t have a blog or website. Can I still participate in your Affiliate Program? Yes, you can. If you don’t have your own website yet, you should definitely check out our excellent selection of WordPress themes. Find the “Become Affiliate” tab. Click on it. Where should I place affiliate links on my blog or website? You should place your affiliate links where they’re easy for your visitors to find — your website’s home page, navigation bar, and any other high-traffic areas. By placing the links in easily accessed locations, visitors will be more likely to click on your links and make a purchase. But remember too that we also provide you with articles, reviews, blog posts, and many other marketing tools to make converting your visitors into sales as easy for you as possible. You can NOT use your own affiliate links to purchase any FormGet subscription plan. Doing so will terminate your affiliate account and you will forfeit any potential earnings. You can not use “FormGet” word in your domain name where you are promoting FormGet because this creates brand conflicts. All actions happening in a month are locked 30 days after the sale has been made. This is done to check if the referred client’s account is still active with us and they are using the service. The referred clients should not be subjected to any refunding issue within those 30 days.